Yesterday, we showed you an official photo from the highly-anticipated Christmas Special for Sherlock, which features Benedict Cumberbatch as Sherlock Holmes and Martin Freeman as John Watson, the later of which is seen sporting new facial hair. During the show's Comic-Con presentation earlier today, the first trailer from the special debuted, revealing the reason why Martin Freeman's Watson has grown out this gnarley mustache. We also get a new look at Holmes' landlady Mrs. Hudson (Una Stubbs), who doesn't particularly care for Watson's latest published story. Executive producer Steven Moffat announced that this special will arrive sometime this December, revealing plans to release the special in select movie theaters in the U.S. It will also air on BBC in the U.K. over the upcoming holiday season. Stars Benedict Cumberbatch and Martin Freeman weren't present at the panel, although Benedict Cumberbatch did appear in a video greeting with actor/executive producer Mark Gatiss, who plays Holmes' brother Mycroft in the hit series. It was met by roars of applause by the Ballroom 20 audience. Executive producers Steven Moffat and Sue Vertue and actor Rupert Graves debuted the trailer, which showcases a Victorian Era setting, and offers a wink to the audience regarding the show's long absence, since a new episode hasn't aired since early 2014. When Holmes tells Mrs. Hudson that he didn't know when he was coming home, since "dismembered country squires" are "notoriously difficult to schedule," it is a nod to the stars' own increasingly busy schedules which have kept them away from the show. 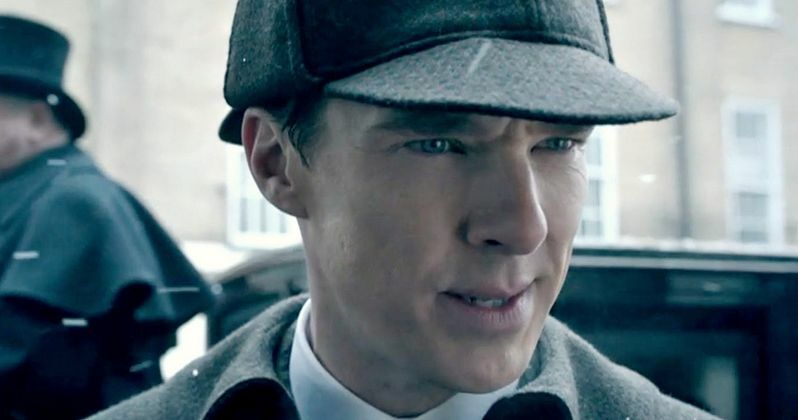 Unlike the first three seasons, which are set in modern-day, this one-off Christmas Special is set in Victorian Era London, the same era when Arthur Conan Doyle's original stories take place. Steven Moffat revealed at the panel that he loves this time period so much that he considered keeping this setting, stating, "It's one of the best ones we've made." Steven Moffat also revealed that he hasn't started writing Sherlock Season 4 quite yet. But he did say back in March that this season will be much darker than the first three, describing certain aspects as "bloody frightening." During the panel, he said the new season's story will "suckerpunch you into emotional devestation," while shooting down rumors of a Doctor Who crossover, and stating that he knows how the series will end. It isn't known when the fourth season of Sherlock will debut. But we'll keep you posted as soon as more updates are available. In the meantime, check out the latest footage from this hit PBS series.